In Italy, the energy consumption of publicly owned buildings is much higher than the average consumption recorded at the European level, with a consumption index of over 200 kWh per square meter per year, even if the efficiency policies following the commitments undertaken at international level for compliance with the Kyoto Protocol, they impose management and managerial solutions based on energy saving to public administrations. All activities related to monitoring and control of consumption and above all the implementation of preventive measures for energy efficiency can be automated. 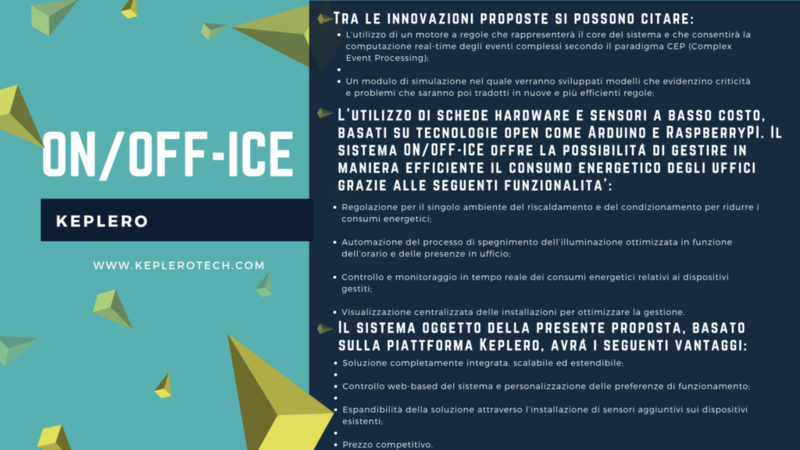 The ON / OFF-ICE project is an innovative tool and will have an important impact on the competitiveness and innovation of energy consumption management processes. The project focuses on different experimental modules through the introduction of technologically and scientifically advanced algorithmic components.